On Saturday, October 18 and Sunday, October 19, come out before your Halloween parties, and kick off Halloween celebration with Vancouver Halloween Parade & Expo. For the first time in downtown Vancouver, the supernaturals, heroes and villains from films, comics, games, sci-fi and myths join the Halloween Parade with marching bands, vehicles and floats. Hundreds of cosplayers will be turning downtown Vancouver into a cosplay stage with many local community groups such as BC Regiment Band, West Coast Thunder Drill Team, BC Motorcycle Drill Team, Anime Revolution and New Image College. The parade route starts from Granville and Davie, goes north along Granville, turns West on Smithe, continues on Howe and finishes at Howe and Davie. The parade is scheduled to begin at noon and ends at 3 p.m. on Sunday, October 19. Two blocks away on the Parade route is the Halloween Expo, a two day convention of fandom, films, cosplay, comics, anime, game, costumes, makeup, arts and performances. The Expo is at Grand Ballroom, Sheraton Vancouver Wall Centre, between Nelson and Burrard, 1088 Burrard St, Vancouver. The event is sponsored by Downtown Vancouver Business Improvement Association and organized by International Health Council in collaboration with partners from Films, Comics, Anime and Game communities, in order to bring back the family-friendly and healthy Halloween, to reduce hateful costumes during Halloween, especially to reduce blood and gore body parts for the young generations. Hundreds of volunteers donated their time and skills to the event. Times: 10 a.m. to 9 p.m. Cost: For ticket prices, click here. 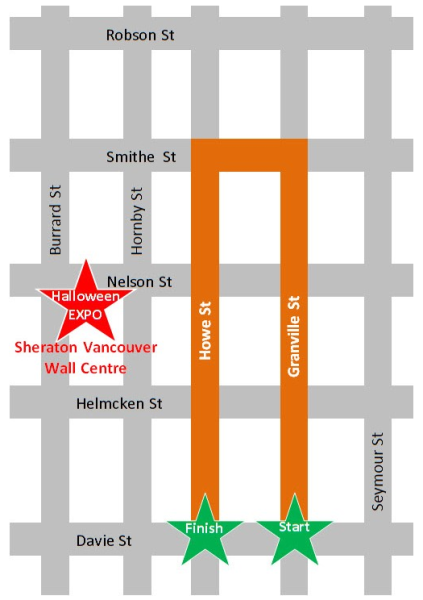 For more information about Vancouver Halloween Parade and Expo, visit www.VanHalloween.com.